You will need Flutter set up on your machine. This tutorial assumes you are using Visual Studio Code for development. Hey folks, in this tutorial we’ll take a look at the new Google SDK to develop reliable and great mobile apps: Flutter. We’ll build a nice UI using Flutter SDK. Flutter enables developers to quickly develop and in an efficient way native mobile apps that can run both onAndroid and iOS devices. Isn’t that great 😌 ? As you might have seen, this is a login UI built with the superb Flutter SDK. Important: We’ll mainly focus on building our beautiful app. For this section, you can take a look here. This link is very helpful and will guide you through the installation of Flutter SDK on your machine(if you haven’t yet) regarding your OS. Now, open your code editor and hit ctrl+shift+p or cmd+shift+p to create a new project, and give it a name, or simply run flutter create your_project_name. After that, you’ll end up with a fresh Flutter project. android - where Android-related files are stored. If you’ve done any sort of cross-platform mobile app development before, this, along with the ios folder should be pretty familiar. ios - where iOS-related files are stored. lib - this is where you’ll be working on most of the time. By default, it contains a main.dart file, this is the entry point file of the Flutter app. test - this is where you put the unit testing code for the app. We won’t really be working on it in this tutorial. pubspec.yaml - this file defines the version and build number of your app. It’s also where you define your dependencies. If you’re coming from a web development background, this file has the same job description as the package.json file so you can define the external packages (from the Dart packages website) you want to use in here. Note that I’ve skipped on other folders and files because most of the time you won’t really need to touch them. Create assets and fonts directories into the root of your Flutter project. You should respectively find their content at this link and here. We add a logo.png to our ../assets folder and the Montserrat-Regular.ttf font to our ../fonts folder. Further in the tutorial we’ll make use of these assets in our app. Among those are the MaterialApp, Scaffold, and AppBar widgets that we’re using inside our app. The methods that we’re using are either part of a library you’ve imported, or part of the Flutter framework itself. Stateful widget: manages its own internal state and keeps track of it. Stateless widget: while this kind of widget doesn’t. For example a button doesn’t need to track of anything. Now we’ll define our home widget, this time it is a stateful widget, this means it will contain fields that affect how it looks. No change here! First, we define a custom text style to apply to our UI elements. We use the Montserrat font as our fontFamily. The final keyword simply tells our app that the object value won’t be modified throughout the app. We define an input using the TextField widget, we added a hint,some style and decoration. We use some padding for adding an empty space inside the surrounding area of the field. We add a borderRadius to have a fancy rounded input field 😎 . The definition of the password field is almost the same as the previous one, except that we add a property obscureText: true to hide input as we are typing, like a password field should behave. We use the Material widget to add easily a shadow(elevation ) to our button. We also add a radius to have a rounded button. Last we add a button as a child our material widget which also take a Text widget as a child. Our button has an onPressed property that takes a function called whenever it is clicked. After that we put all these widgets together inside our Scaffold widget. Our form elements are aligned vertically inside a Column widget. Generally, we use the SizedBox widget just for spacing purposes. We add an our image inside a SizedBox in order define a height for it 🙃 . That’s it! 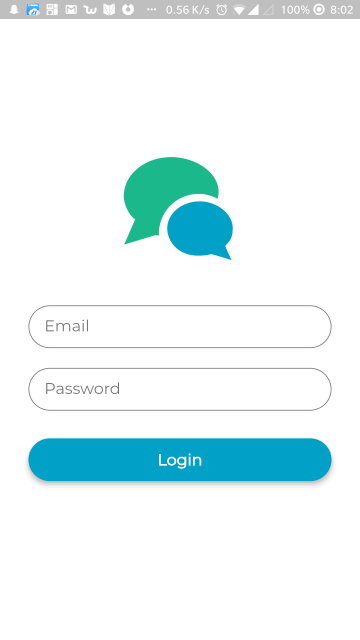 In this tutorial, you learned how to create a beautiful login UI with Flutter. You also learned some basic concepts of the Flutter SDK. I do hope you acquired necessary knowledge in order to continue exploring Flutter. You can find the code used in this tutorial on its GitHub repo.